ISOLgate is a new Causal Factors Database within MIRMgate (Minerals Industry Risk Management Gateway). It provides information, potential solutions and opportunities to improve safety of isolation maintenance and use of isolation equipment at any mine site, or related operation or service. In contrast to other databases, it offers information and background on isolation related accidents and incidents and what mitigative steps have been taken to reduce the risks that led to the mishap. The latter is considered of high priority and value to safety and risk managers on mine sites, maintenance and operations personnel, manufacturers of isolation equipment, Original Equipment Manufacturers (OEMs), and isolation service providers that are proactively searching for sound advice to advance safety through isolation usage. ISOLgate offers a comprehensive search database covering iso related accidents that have been categorized using the Incident Cause Analysis Method) (ICAM). ISOLgate establishment is funded by the Australian Coal Association Research Program (ACARP). What is a 'ISOLgate Checklist'? 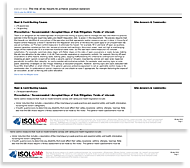 'ISOLgate Checklists' are dynamically created and the users are able to print these Checklists and take them to the site or boardroom and able to discuss where the major risks might occur and how to prevent them from causing accidents. The Checklists are designed to assist the users to identify if issues and industry adopted solutions exist within their workplace. Access to checklist is gained through the graphs by clicking on relevant categories and factors or browsing by root cause, consequence and risks found on the left hand side of the ISOLgate homepage. The graphs produce search results containing incident checklists under the EMESRT risk ID. The checklists can also be accessed using keyword search. Each search result contains a pdf checklist link. More information can be found in the ISOLgate usage guide. The search results also contain a direct link to the EMESRT risks related to isolation.